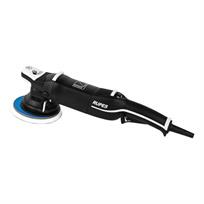 The RUPES LHR 21 Mark III has taken on the successful elements of the BigFoot concept and improved upon them again. Built to handle any detailing situation, the new LHR 21 Mark III is the new frontier of detailing. The ergonomic design allows for precise paint correction with complete comfort, in curved surfaces and difficult to reach areas. The rubberised front grip of the Mark III offers exceptional comfort for the operator while providing a non-slip surface for control. The improved rear handle also integrates rubberised surfaces for improved feel. Adding an additional layer of control is the new progressive trigger. Acting as a throttle to control speeds within the dial range, the progressive trigger allows the operator to make subtle adjustments for precise control without interruption of the process. Available in: Machine Only, Standard Kit & Deluxe Kit.